Deepscorn Hollow is an underground lair southeast of Leyawiin catered to infamous characters (plugin-specific). The Hollow becomes your property after the Deepscorn Hollow quest is completed. It is added by the Vile Lair official plug-in. The following upgrades may be purchased from Rowley Eardwulf at the Wawnet Inn. More details are available on the Oblivion Houses page. Note: Rowley Eardwulf may not have the upgrades available when he is supposed to. See Bugs. Description: A desk with various ingredients and a coffin bed. Once you purchase the Bedroom Area upgrade, a desk will be added to a corner of the bedroom with a set of novice-level alchemy equipment and a few ingredients, most notably a harvested Nirnroot sample which respawns every three days. This is the only respawning sample of Nirnroot in the game, providing a slow but steady method of gathering Nirnroot for the Seeking Your Roots quest. 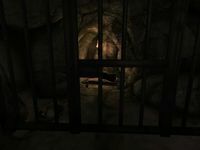 Description: A prison cell with an unwakable captive for vampires to feed on at any time. The Cattle Cell upgrade adds a prison cell with a perpetually sleeping prisoner for vampires to feed on at any time. He is marked as an essential NPC, so he cannot die. 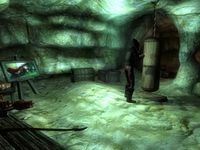 Because he is essential, the prisoner can also be used as a method for training various skills, including Blade, Sneak, and Destruction. Description: A vampire minion who can be sent out to murder, bringing back the victim's items for you and adding one infamy point. You will receive one infamy point. Random loot is added to the Victims Loot Chest (leveled gold, 25% chance jewelry, 10% magic armor, 10% magic weapon, 25% unenchanted weapon, 10% soul gem, 25% lock pick, 25% potion, 25% poison). This chest is safe, so the loot can be left to accumulate. 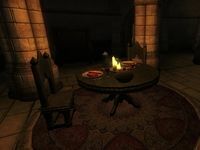 Description: A table with various foods, several cupboards, and improved lighting. Description: A garden which contains strong poisonous ingredients, including the new Chokeberry Vine. Description: Adds various chests and crates for safe storage. The Storage Area upgrade adds a number of storage chests to the nook located just off the main garden. This upgrade also includes Greywyn's Poison Supply, a chest containing several poisons. 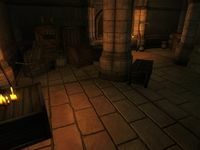 Description: A desk and bookshelves with several rare or unique books. The Study Area upgrade provides two new books: the Manifesto Cyrodiil Vampyrum and Opusculus Lamae Bal ta Mezzamortie. The study also includes five skill books, some of which are unique: Sithis (Alteration), Immortal Blood (Hand to Hand), Rislav the Righteous (Light Armor), The Gold Ribbon of Merit (Marksman), and Sacred Witness (Sneak). Description: A potion necessary to activate the Shrine of Sithis. 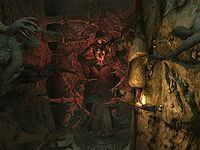 The Ichor of Sithis is needed to restore the Shrine of Sithis, which is just like the chapel shrines that confer blessings. 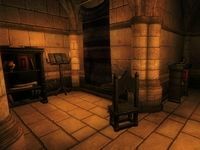 Unlike chapel shrines, however, the Shrine of Sithis only provides blessings if your infamy is higher than your fame. 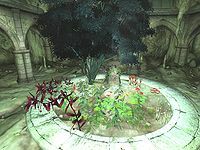 6 non-respawning Nightshade flowers float above the water at the base of the shrine. The shrine requires that your Infamy must exceed your Fame. Characters with a higher (or equal) fame will be prompted to "Recant your honorable nature and you shall be rewarded!" Much like chapel altars, you may only use the Shrine once per day. If you have completed the Thieves Guild quest line and have the Gray Cowl of Nocturnal, donning the cowl will give you instant infamy of 100 allowing the highest level of blessing. 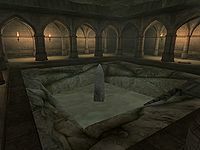 The Font of Renewal is a pool of water that houses a shrine where you may purge yourself of Vampirism using the new Purgeblood Salts mined from the nearby Purgeblood Crystal Formations. No upgrades are necessary to use this font. If you use the Font of Renewal, you will not be able to complete Vampire Cure as you must actually be a vampire when doing the quest. As a result, if you start the Vampire Cure quest and then cure yourself using the Font of Renewal you will be unable to continue the quest and it will remain in your journal forever. Greywyn's First Cache is located in the left-hand side corner of the first room you enter (behind the garden). Greywyn's Second Cache rests beside the Font of Renewal under the water. Greywyn's Third Cache is located in the corner of the Cattle Cage that holds the feeding body near the Cell Door. (If you have not yet purchased the Cattle Cage upgrade, this location is in the cave-like room on the west side of Deepscorn Cloister, hidden against the wall south of the entryway). Greywyn's Final Cache is behind a glowing blue rock on the left side of the Shrine to Sithis area. This one cache will contain a random, leveled enchanted ring or necklace. High above the first room (where the Garden of Venomgrowth is eventually placed) there is a bucket filled with gold. If you shoot it, the gold will fall to the ground. This is mostly for the novelty value of seeing all the gold come out, because you will have to pick each piece up individually. Any gold you do not pick up will respawn in the bucket after three days, meaning you can shoot it again and again and pick up any hard-to-find coins. Located on top of the Shrine to Sithis is an "Unusual Box" that contains yet another unique leveled item, the Crimson Eviscerator. This box, and the dagger, are present when you first enter Deepscorn Hollow. Immediately to your left when entering the first room is the storage area. Once you purchase the Storage Area upgrade, you will find Greywyn's Poison Supply hidden in the back of this room. This is a chest filled initially with a dozen or more poisons of various useful varieties. This chest can also be used as a storage container. For example, using the ingredients from the nearby Garden of Venomgrowth you can make quite powerful poisons even at low Alchemy levels. This chest is a good place to store your most wicked concoctions separate from your healthier ones. There are three scattered jewelry boxes that contain some jewelry (possibly enchanted) and possibly some potions. Once you purchase all the upgrades for Deepscorn Hollow you are rewarded with a special item. The Deepscorn Bedroom gets a special piece of furniture called Greywyn's Armoire next to the Coffin Bed. Inside you will find the leveled Raiment of the Crimson Scar which is basically an upgraded version of the Dark Brotherhood's Shrouded Armor. See Deepscorn Hollow Items for a list of items added by the Vile Lair plug-in. 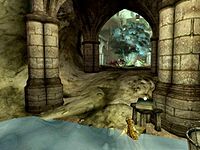 The trapdoor entrance to Deepscorn Hollow located behind a rock to the west does not appear until you enter from the main underwater entrance. Some users experience an issue in which the Dark Minion disappears on a mission to kill somebody and never reappears. This may be caused by the Minion's scripting; the player needs to be near where he left for the scripting to resume processing. If your Minion has disappeared, go to where the trapdoor ladder is and he may return. Using the "player.moveto" console command with the refID of the Dark Minion may cause him to reappear. It is possible for the Minion to stop correctly functioning if he gets sent out on a mission repeatedly because of some variables not being reset. This bug is fixed by version 22 of the Unofficial Oblivion DLC Patches. The trap door exit in Deepscorn Cloister cannot be used by NPCs to exit Deepscorn Hollow (apart from the Dark Minion, whose departure is scripted). If anyone were to enter through the trap door and then proceed to leave, they will attempt to activate the trap door, but will not be able to exit (similar to the Summitmist Manor door glitch, but not as irreversible). 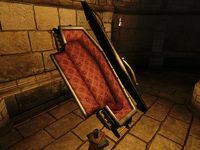 This bug is fixed by version 18 of the Unofficial Oblivion DLC Patches. In order to fix this, simply lure the person out through the main entrance. If the Unofficial Vile Lair Patch is activated, Greywyn's Armoire will become unsafe for storage. It will spawn a new Raiment, but any other items stored inside will be lost. This bug is fixed by version 12 of the Unofficial Oblivion DLC Patches.